I thought he was a japanese in Tokyo. Love this style! Love how he wears the shirt!! So cool! 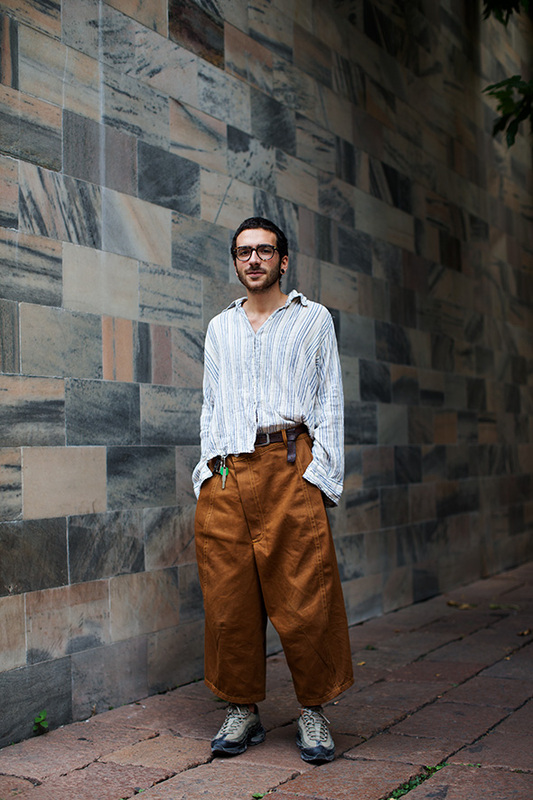 Love the colour of the Bobo the Clown trousers…not a fan of the fit…but he sure wears them well.His chunky sneakers are seriously cool! Love this. Simple, comfy and stylish. Interesting blend of classic color scheme and contemporary fit. I like the shoes and the shirt, but the pants are silly. Good color, though. No! No to all of this. Well, the wall behind him is pretty cool and it goes with the colors in his clothes, but that’s all. Thank you!!! I was afraid that I was the only one who thought this was clownish and not in a good way. He looks like a slob and in no way stylish. This gentleman, on the mast of a ship, could power a trans-Atlantic voyage. To be honest, my first thought was the Titanic! hahahaha, I liked this comment so much! Indeed this look does not work for me either, I think the shoes are a disaster and the pants, albeit interesting, are too short. Ahoy captain! This oversized look is everything! Woo-Hoo! I sure couldn’t attempt this, but he’s cool with his statement. You Go, Dude! Why is he wearing a potato sack? Love the oversized look, even though I’m no a huge fan of those shoes! Hah hah hah hah hah hah! very strange but I like it, a different one. Big volume but probably needed a little more thought on the details. Like the shirt and the green key. I know, picky picky. But wearing insouciance is like adding brandy to the recipe, a little goes a long way. I think Henri de Toulouse-Lautrec might have approved of this look. I’m with you, sorry but not for me. Nice work. Good visa info. Thanks.